Press one pie crust sheet firmly into the bottom of the pie dish and up the sides of the pan. Trim the edge of the dough with kitchen scissors; leave 1 inch of dough to hang over the edge of pan. Set aside. Combine the apples and lemon juice in a large bowl; Mix well. Add brown sugar, granulated sugar, flour, cinnamon, salt and nutmeg. Mix well, making sure to coat all the apples. Transfer the filling mix to the dough-lined pan. Disperse cubed CannaButter on top of the apple filling evenly. Place the second pie sheet over the filled pie. Trim edges appropriately, leaving 1 inch of dough hanging. Fold the edge of the top layer of dough under the edge of the bottom layer of dough. Pinch dough sheets together to seal. Cut a “x” across the top center of the dough to allow steam to escape. Remove pie from refrigerator and bake the pie in the preheated oven for 1 hour, or until the crust is golden brown and the filling is bubbling. Transfer pie to a wire rack and let cool to completely set for at least 1 hour before serving. 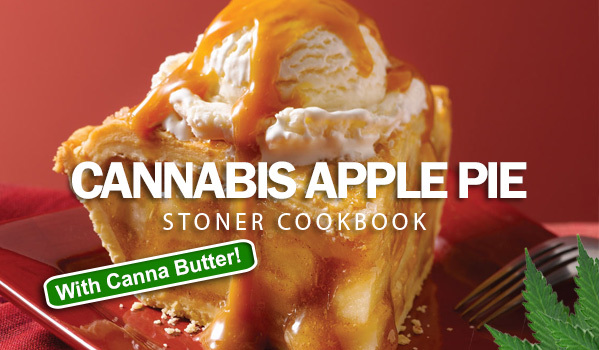 Serve With Whipped Canna-Cream or Cannabis Ice Cream for a heightened experience!